How can I figure out those error codes? You see it all over the place, in text based logs, windows event logs, everywhere. I’m talking about error codes such as 0x8007005. But what do they really mean and how can I find out more about them? You could try Google of course, but that might give you a heap or misdirected answers that don’t apply to your situation. Instead, let’s find out more about what the error code really means. Microsoft have made a very small utility called err.exe. 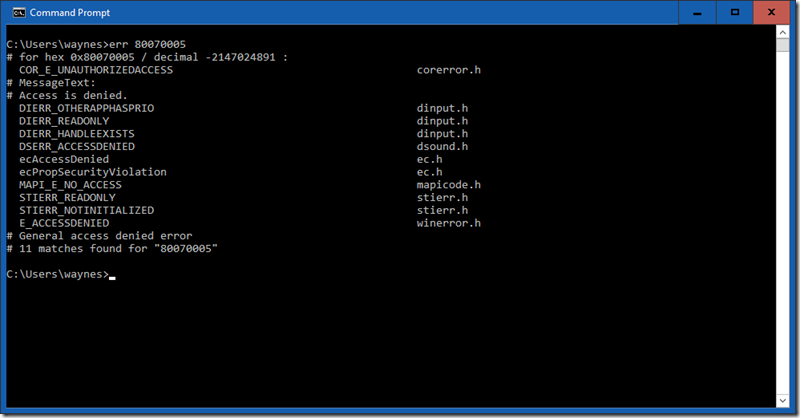 This is hands down the best command line tool I’ve used as it provides a heap of information on any given error you might have. The entire point of this tool is to provide translation of the error codes into a more intelligent error message. Microsoft developers have used the same codes for many years across many products. 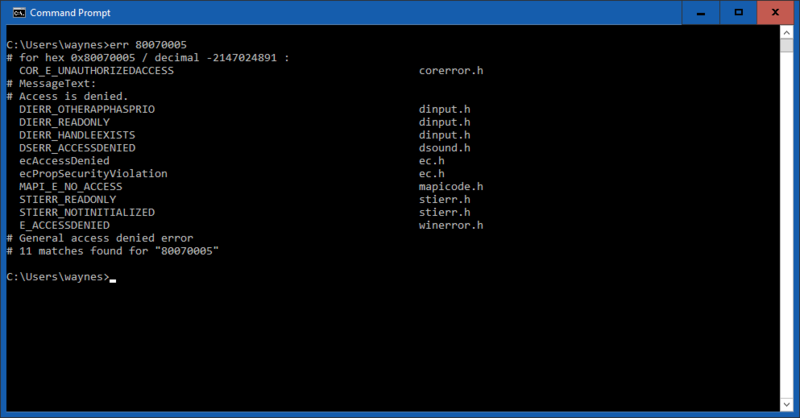 For instance, how many times have you seen the 0x8007005 error in an application? Armed with this information, you’ve now got further avenues to explore when you are investigating a funky issue. Where can I get err.exe? You can download it direct from Microsoft here. Once downloaded, put it somewhere in your system path – ie c:\windows\system32 so you can get to it from anywhere using your command prompt. I hope this helps save you some time and effort when you are fixing systems! That will come in handy for sure. Thks wayne.